If we always use the real title of the recipe, it will be way too obvious that so many of our recipes come from the Les Halles Cookbook by Anthony Bourdain. The real recipe name here is Coquilles Saint-Jacques with Champagne, and no matter what you call it, it’s a recipe that we would highly recommend. 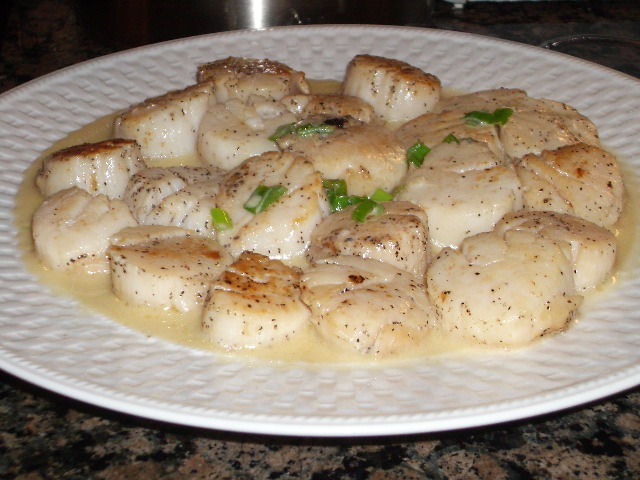 He recommends, as we do, that your scallops for this recipe be nice, big sea scallops. As our goal is frugality, we have to admit that you’ll still have a great dinner if you go with the much cheaper (and smaller) bay scallops, but sometimes it’s worth it to live it up. If you have the luxury of being at the beach and buying fresh scallops, then that’s even better! this looks amazing! i think sandy and i had something just like this at old fort pub one year – we still talk about it! Oh me goodness – I wish I could have come to dinner on this night! My favorite! Now I am starving – great picture!